When everybody was expecting to see news from Colombia about the preparation of 2013 World Cup U-20 , today an unexpected news appeared on rh-news website: Iserlohn in Germany will host this World Cup.From 26.10. until 11.02.2013, Hemberghalle will receive the best of the future of our sport. The confirmation of this change of plans was done this morning by Mr. Harro Strucksberg to ERG Iserlohn president, Ralf Henke. According to Iserlohn website Argentina and Colombia lost the the application process, despite the great efforts by CIRH governing body. Thusthe competition returned to Europe, to Iserlohn. Ralf Henke doesn't want to appoint more reasons for the host city change, but is sure that they want to welcome both Argentines and Colombians national teams. From Europe: Spain (actual champion), Portugal, France, Italy, Netherlands, Andorra, England, Switzerland,Austria, Israel (hopefully). From America: Argentina, Brazil, Chile, Uruguay, Colombia, Mexico and USA. From Oceania: Australia and New Zealand. "But it also means that now a lot of work in the next ten months, waiting for us," Henke also know that with the commitment by the FIRS great responsibility rests on the shoulders of the Germans. Because the cycle of - the last World Cup was held in Portuguese Barcelos - actually the South Americans would have their turn. "They could not agree, however, there were some inconsistencies across the Atlantic," Henke has brought in experience, so was waiting with the Tournament award relatively long.During eight days Iserlohn will be the hub of roller hockey world, because the best U20 young players will be there: the 19-year-old Portuguese rh player Helder Nunes, the 17-year-old Frenchman Carlo Di Benedetto, or Italian Giulio Cocco apply (17) as a rising star, where a large international future is predicted. After the 2013 A World Cup country change from Mozambique to Angola, due to financial problems, now it's the U-20 competition to have their own problems. We hope that all this incongruities don't deviate roller hockey countries and federations from the main Goal, a better future of Roller Hockey. Austria - 4th place in 2010 edition. Searching hard to be in Angola 2013. England - relegated from San Juan 2012, it is the home-country of roller hockey, so either goal than promotion is searched. Egypt - after the revolution in 2011, the news about roller hockey disappear so the fans wait for this World Cup to see how is the sport after so much obstacles. Israel - consider as one of the best examples of sustainable growth on our sport, counts with the experience of his Spanish coach which expects to see his team in Angola next year. Macau - the best of Asia roller hockey is on this team, but the continuous non-support by local Government with better conditions to practice and develop the sport, reduce the targets for the World Cup. Mexico - the last participation in this competition remounts to 2006, also in Uruguay. Since them a big crisis stop the development of this sport in Mexico. The last news indicates that finally there's light for the future and again almost only roller hockey players will be part of the national team. Netherlands - also relegated from San Juan World Cup is one of the best teams presented. The sport seems to be gaining a new path for the future with a national championship organized each year and a successful team in German League. South Africa - the promotion to last A World Cup could mean a better development to roller hockey in such important country, but since them there wasn't big changes. Uruguay - the host country is increasing the promotion to this sport day by day, and this competition is faced as the right opportunity to be part of the main group of roller hockey. The opening ceremony will be today at at 7:30 pm (+3 GMT), and the first match will happen next at 9pm between Uruguay and Mexico. For the first time ever the B World Cup will be totally broadcasted, through the local radio Señales with Spanish comments of our Amigos Carlo Albaneze and Ricardo Infante, so there are no excuses to not see roller hockey next days!!! To know more about the competition, matches and time, consult all the websites and facebook pages available. Unhappily Pakistan couldn't take part on this World Cup as happened in last Asia Cup. We hope that the condition of our sport can improve for the next years competitions. One more season is getting close to finish in most European Championships. After Barcelona, Dornbirn, Nofit and Quevert victories in Spanish, Austrian, Israeli and French championships, also 1ª Divisão in Portugal it's almost finding it champion. After another amazing and emotional Clássico between the two biggest Portuguese roller hockey clubs, Porto and Benfica, the final result was 5-5. This result is favorable to the home team, Benfica, that can stop Porto's supremacy in Portuguese hockey in last decade. With one more point than Porto, Benfica will try to win Tigres de Almeirim on last journey, and assure it 21st Portuguese title. But the reason of this article has something about Emotion and Atmosphere in roller hockey, as happen in sports like football and basketball. Which amateur sport can have something like the next video??? This was the last Benfica's goal appointed by one of greatest Portuguese players, Sérgio Silva. The celebration after was unique, and is an image about how special is this sport for a lot of people!! Although our sort can't have the same visibility, managers with the same perspicacity, and of course the same money than the majority of other sports, has something special, some kind of mystique and passion. It is just because of this that roller hockey can't stop!!! The same happens with the most important Club Championship, European League! Next days, from 24th to 27th May, Lodi (Ialy) will host the fantastic Final Eight of the Best Club Competition in the World! The best 8 Teams of Europe will be fighting for such honor!! Don't waste this opportunity to watch the best sport of the world Live!!! View more documents from xaral. As reported on 15th FIRS B World Cup held by Uruguay post (3rd October 2011) Uruguay will host the B World Cup this year. Although the host city was supposed to be Montevideo, due to some reparations in the stadium, the host city was moved to Canelones, being Gimnasio Municipal Sergio Matto the place to play the Championship (wood floor). Also the initial date, 20th to 27th October was changed, and the Championship will be held from 24th November to 1st December (According to Uruguayan source info). Our sport is played at this city by one of the most important roller hockey clubs of Uruguay Pinamar Hockey. Until now there are just a few informations about the organization of this important championship, where everybody wants to see again a lot of usual countries playing it and if possible new countries not used on it. To note that is expected the presence of a "False Mexican team" supported by the "official" Mexican Federation, FEMEPAR.This false team will be composed by in-line hockey players, as happened in 2012 Women's World Cup in Alcobendas, with the support of FIRS. This is part of the strategy of this federation to not loose the place at FIRS to represent our sport, but all roller hockey fans know their real goal, kill our sport in Mexico. Although we hope one day there will be justice and the "Unofficial Federation", AHPM will have the opportunity to represent our sport national and internationally. Amazing no?? How an almost unknown country in Roller Hockey like Pakistan can achieve the goal of a presence in TV news, something that is almost impossible in the rest of world countries!! An important thing to say for somebody that watch the video is the problem that sometimes exist in poorest countries. In an official roller hockey tournament the inline skates are not allowed but with all the problems to arrange the normal quad skates, it's diffiult to say no to the players. This is something that CIRH and FIRS should be worried to change, because is one of the main differences between the two sports. If you are curious about Artistic National Championship watch also this video, where it is possible also to watch the main responsible for all Roller Sports in Pakistan, our dear Mr. Khalid Saeed. Pakistan showing to the World that with some efforts is possible to bring the Media to our Sport. 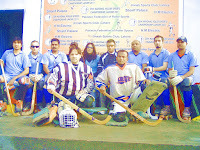 Two images concerning the 25th Roller Hockey Championship, that took place in Allama Iqbal Park, Lahore. The first one with the match between Punjab Yellow and Punjab Blue. The sencond an image about the attendance during this competition. 01. Punjab Blue. 02. Punjab Yellow, CDGK Cheetas (Sindh) 04. Karachi King (Sindh). We hope that this championship could be the begging of a better future to Pakistan Roller Hockey, a Better plan management, and school bases program is required for this success. 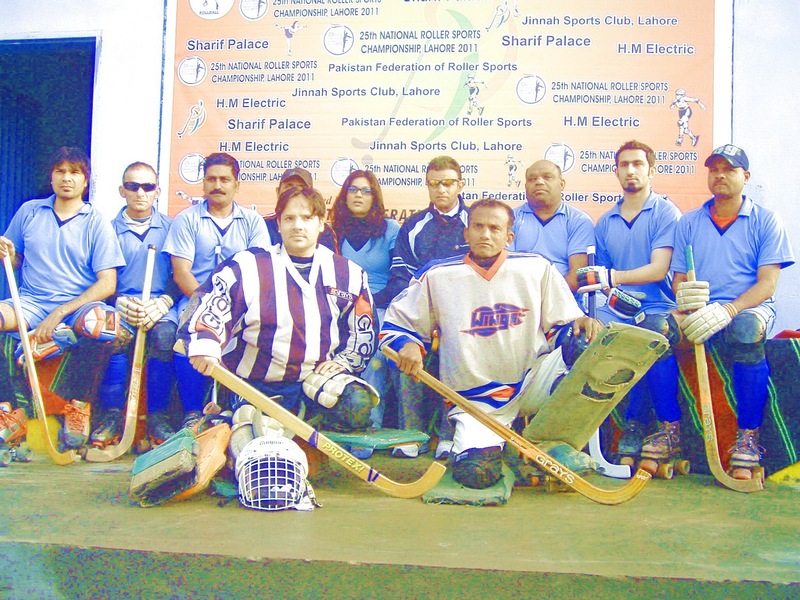 National championship is going to happen in Lahore from 26th to 29th December 2011. The unique Province not presented will be Khyber Pakhtunkhwa. Otherwise there are no information about the quantity of teams coming from each province. 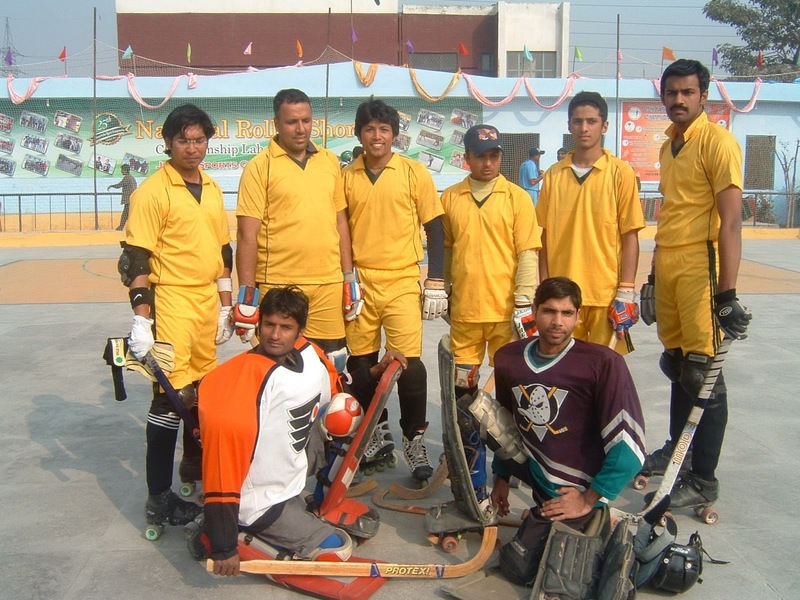 Our blog suspects that probably Punjab team will be the same than Jinnah Sports Club, which competed last October month in Roller Hockey Premier League in India. After some years without national competition, this will be one more great challenge to Pakistan. In other hand Pakistan will prepare it players to the 15th Asian Cup. 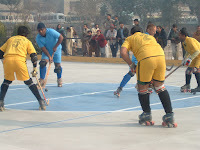 This is a great opportunity to promote roller hockey in Pakistan.It would be good if Asian Confederation, CIRH and FIRS could help this countries with the developing of Roller Hockey. Since the beginning of Roller Hockey activity that Asia is one of the worst continents concerning it. CARS (Confederation Asia of Roller Sports), presided by Mr. Sheng Zhiguo, doesn't promote and develop roller hockey. CIRH doesn't promote the rising of an Asian Roller Hockey Confederation like happens in Africa and Europe, which would have a main role in our sport. 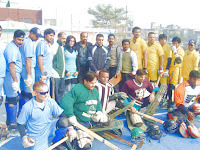 Few countries play Roller Hockey, for example in last Asia Cup, only Macau, India, Taiwan and Japan were present (China, North Korea, South Korea, Pakistan, Hong Kong had been played roller hockey years ago). Asian Cup is the unique international competition in Asia-there's any competition between clubs. For example it's not decided yet the location of 2012 Asia Roller Sports Cup. "Hoje Macau" talks about China, but there's any confirmation, just some months before the competition, reveling all disorganization of CARS. Unhappily the situation seems to change forever, due to many facts. The president of Associação de Patinagem de Macau (Roller Sports Macau Association), António Aguiar, and their players accuse Macau Government to not build a new Roller Hockey rink, where could be possible to practice our sport. The unexistance of rink to play stopped the Macau Championship and the school bases program in Casa de Portugal (2005 and 2006 was the last time reported) wasn't reported any more. 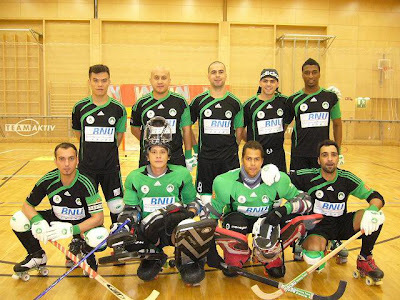 According to "Hoje Macau" Dom Bosco, the same rink that doensn't have conditions to practice roller hockey, received in last days of October the Inline Hockey Championship!!!! Worst than that are the teams playing it... the same that played roller hockey until some years ago. All this situation is quite curious and revels that some people is lying. Seems that soon Roller Hockey will be substituted by Inline Hockey, forgetting all cultural connexion between Portugal and Macau, where inline hockey is not included. Like happens in a lot of things in Macau, the Region doesn't resist to China invasion, and forget all it ancients. Some months ago other newspaper from Macau, "Ponto Final" reported the opinion of Antonio Aguiar (APM president) concerning the actual presidence of CIRH, by Mr. Harro Strucksberg. He said that there were some movements to take off Mr. Harro, and he was a possible name to manage CIRH. Rolling Together just has the doubt... How a man that is not able to manage roller hockey in his own region wants and thinks will be able to coordinate roller hockey all over the world??? 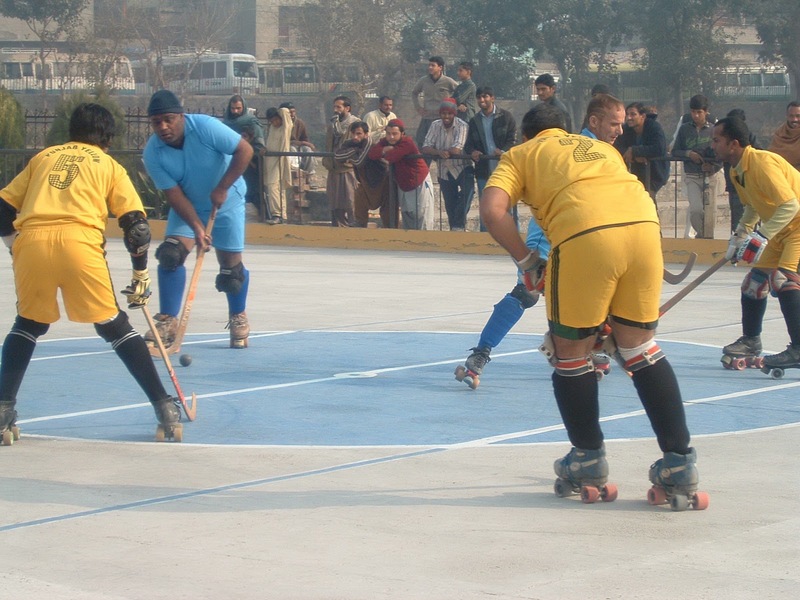 Pakistan Roller Hockey has a new place to report all news about the sport. We hope to show a lot of news of this sport in Pakistan. In the last years Pakistan wasn't part of Asia Cup, B World Cup and U 20 World Cup, so now is time to change and give a jump to the future.